München. That means the most expensive rents of Germany, Weisswurst, Beer, Oktoberfest, the Isar and the ISPO. Except the first & fourth point I sampled all of what Bavaria’s capital had to offer, and then some more. 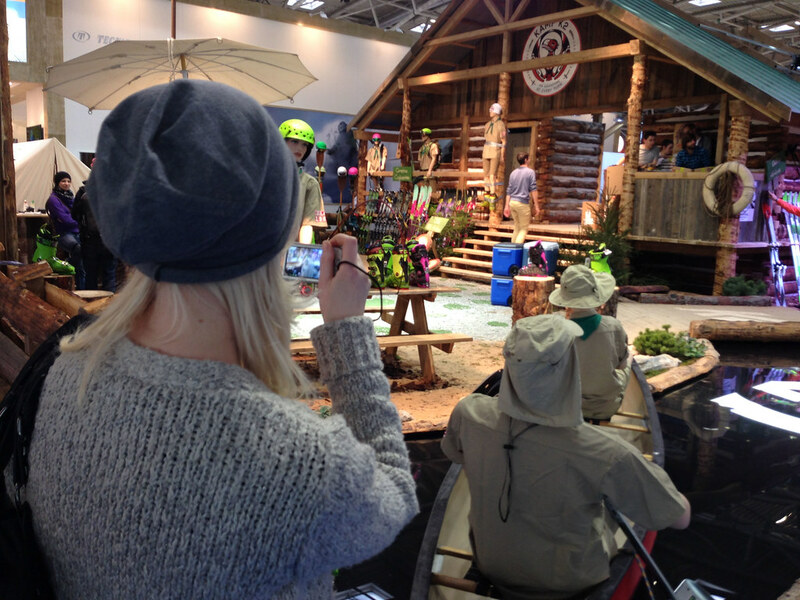 But the ISPO, the world’s largest (Action) Sports Fair, was the main reason for my visit to the deep south of Germany, and an interesting fair it was. 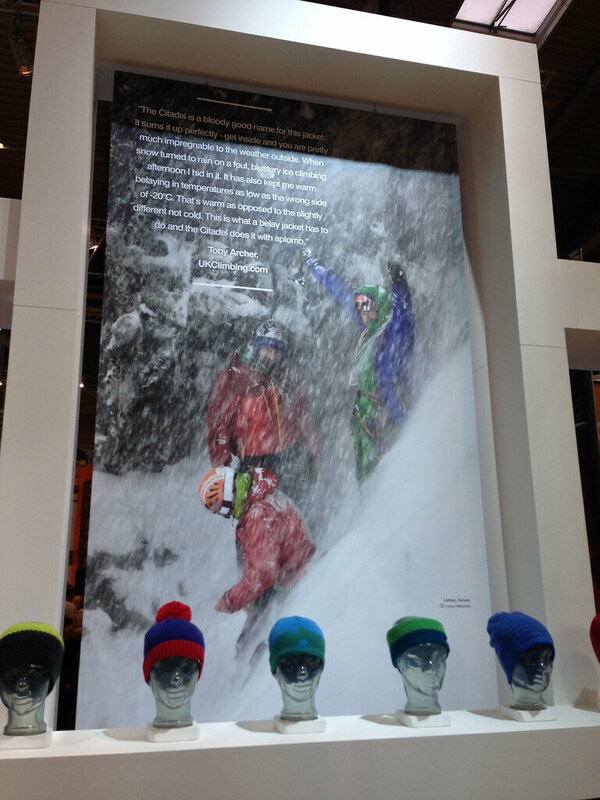 This was my first ISPO, and my reasons for going were to see the new gear and trends for 2014/ 2015. 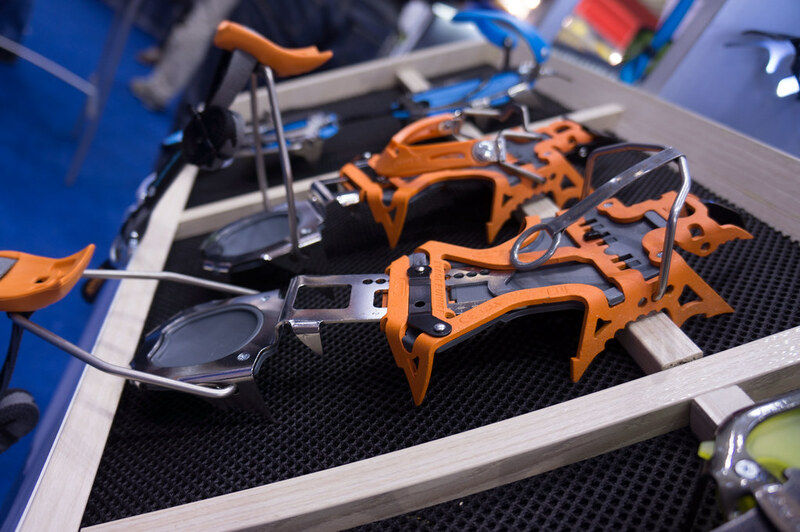 And there were quite a few interesting things on show for ultralight backpackers, climbers, & packrafters alike. A taste of what’s to come. The Canadians keep on innovating, and their Alpha Comp Jacket and Pants combine a WPB GORE® Fabric with the Arc’teryx Fortius™ 1.0 softshell material. It’s a garment tailored towards those that like to spend time ice climbing and going up high in the Alps, and should deliver freedom of movement and enhanced breathability.It has all the great details you’d expect from an Arc’teryx garment, Storm Hood, harness compatible hand pockets, and of course it looks superb. Then there’s the Cerium SL Jacket, an addition to the Cerium family. 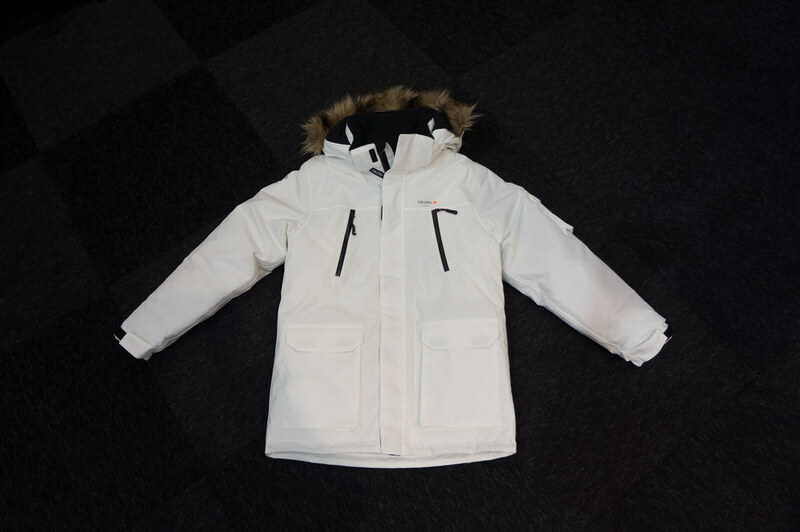 It uses a silky, ultralight, downproof 7D Japanese nylon called Thisela™ as a shell, and inside you find 850 fill power European grey goose down and 100 g/m2 Coreloft. It’s unbelievably light & warm, and I will have a review about this piece coming in due time. AustriAlpin makes climbing hardware, in Europe. Their fifty:fifty autolock carabiner has two identical compartments that open and close with a sliding, spring-loaded clip. This mechanism allows you to open either the lower or the upper compartment, and as soon as one lets go of the clip it locks automatically. I met the team of Nihil Climbing by coincidence, and lucky I was. Very nice folks, and their gear looks great. 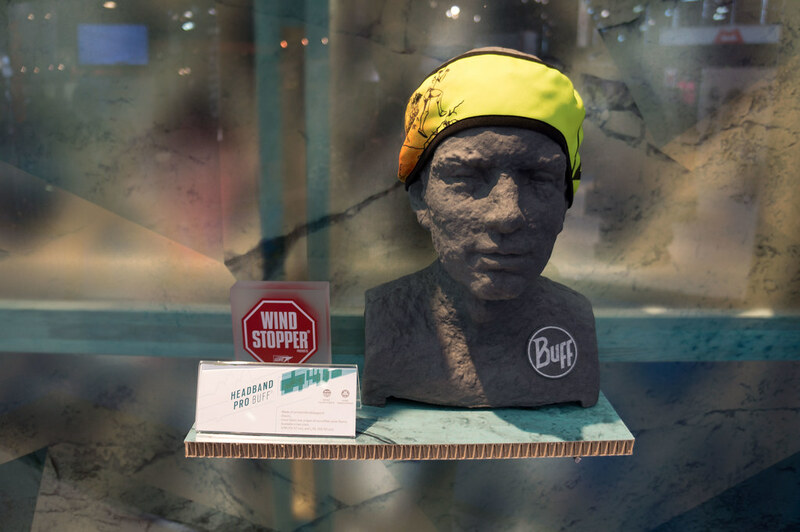 Irene, the designer, is the Dutch bouldering champion of 2003 so really knows what boulderers and climbers need from a garment. All the gear is made in Portugal, and combines great looks with the functions a climber needs. Definitely a company to check out! I have interviewed Jan from Röjk in the past, and hence was delighted to meet him and Linus at the fair. 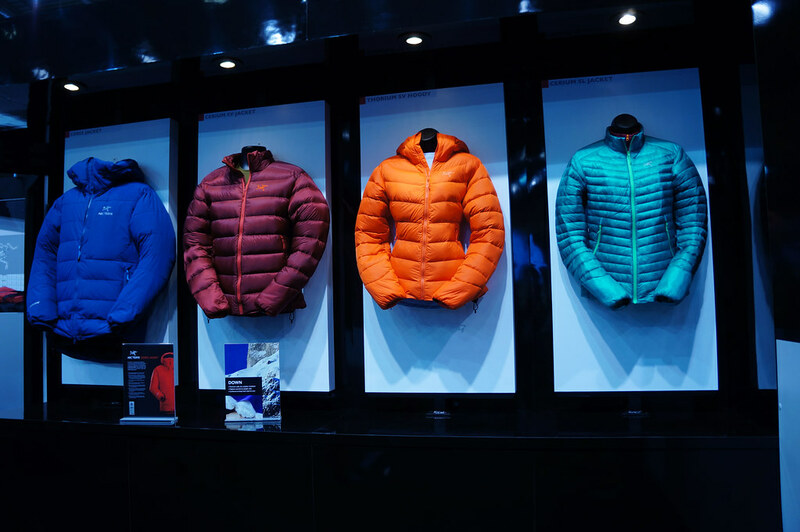 They also won the coveted SOG Award for their SuperBase, which uses Primaloft yarn - a mix of Merino wool and PrimaLoft. 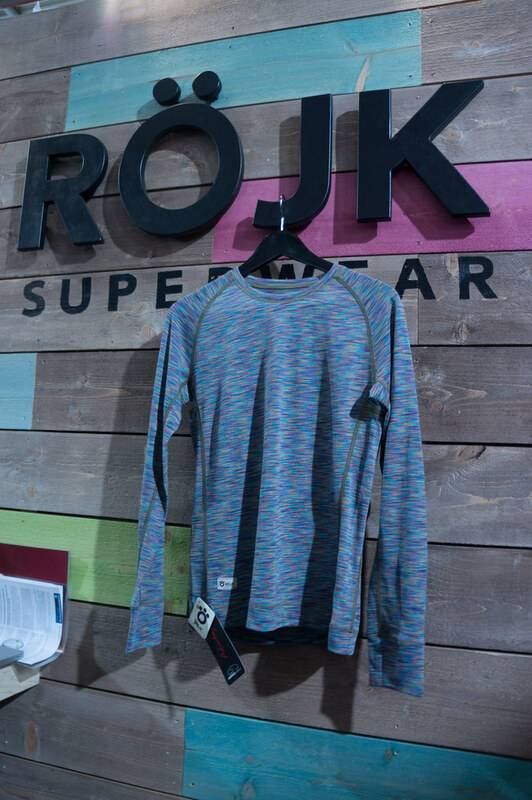 It’s a great looking baselayer, and I’m sure it will be just as comfy as the Röjk Tvister. Outdoor Research also continues to innovate on all ends. I was very impressed by their ALTIheat gloves, which are gloves with heating technology. They warm up your hands thanks to the included rechargeable battery, up to 8 hours long, and then can be recharged at the lodge or your battery pack. It’s something not everyone will need, but for those that climb in very cold temperatures, it sure looks like a great series of gloves. 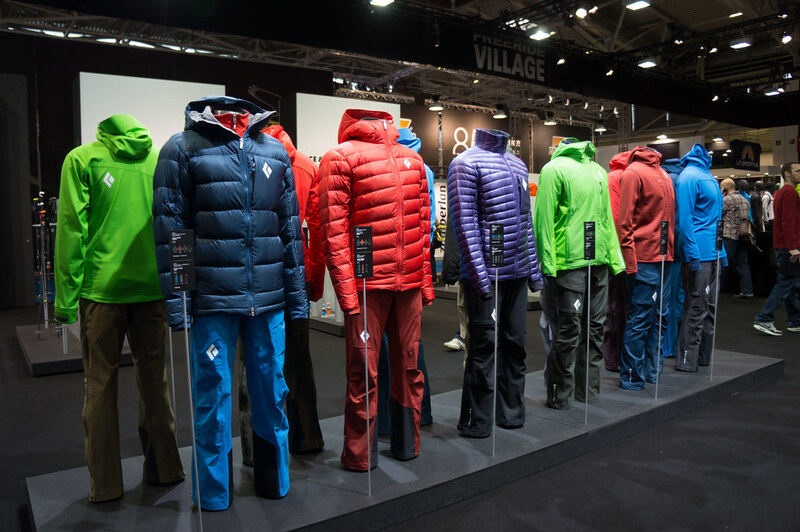 Also garment wise the company from Seattle moves ahead, with the use of various fabrics of Gore-Tex, Pertex, Primaloft and Polartec to suit the needs of hikers, runners and climbers alike. 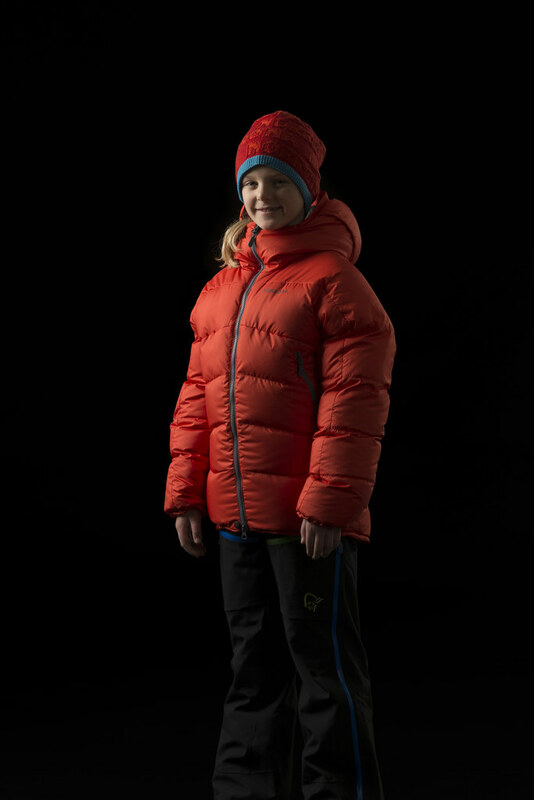 The Superlayer Jacket for example melds the warmth of a synthetic puffy with great breathability and moisture transport to create a mid-layer with the ability to self regulate temperature - no more need to take of layers (in theory, at least =). 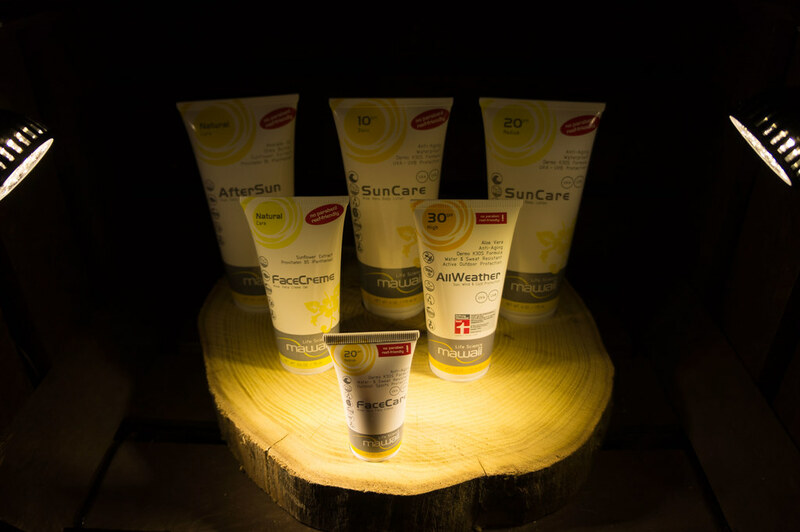 It offers light wind and weather protection and wicks moisture quickly away. 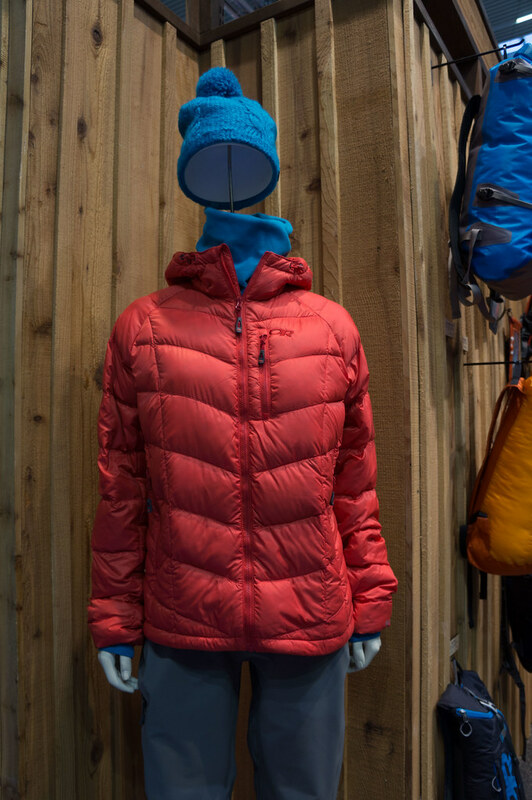 Mountain Equipment has launched a slew of new garments, many in the insulation category. 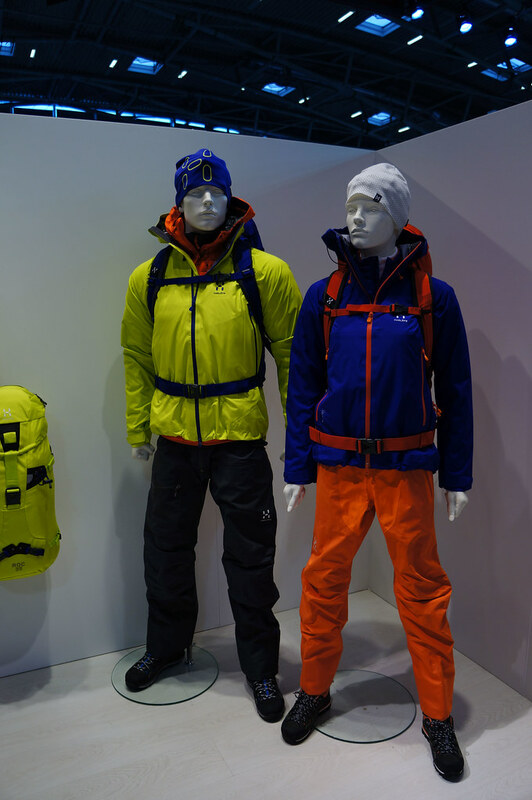 Here the Brits set on Down (Check out their Down Codex) and Polartec Alpha. Also new hardshells are coming out, in different technologies: Drilite, their own membrane, and Gore-Tex. Very nice looked the Eclipse Inferno Jacket, a midlayer from Pontetorto Technostretch fleece, which has a comfy asymmetric zipper. 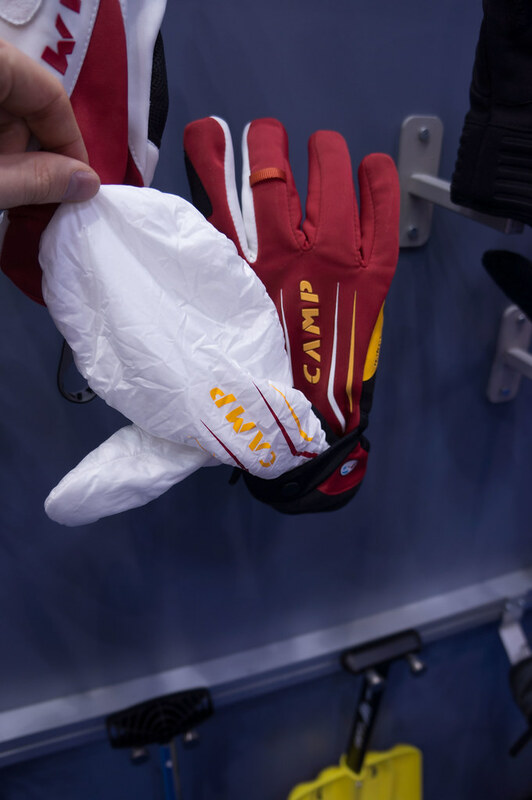 Also their gloves looked great, and they also got an award for their sleeping bag. Haglöfs introduced an urban line called 19FOURTEEN, which will be available in the autumn. The garments combine functional materials and urban styles, and do look very nice. 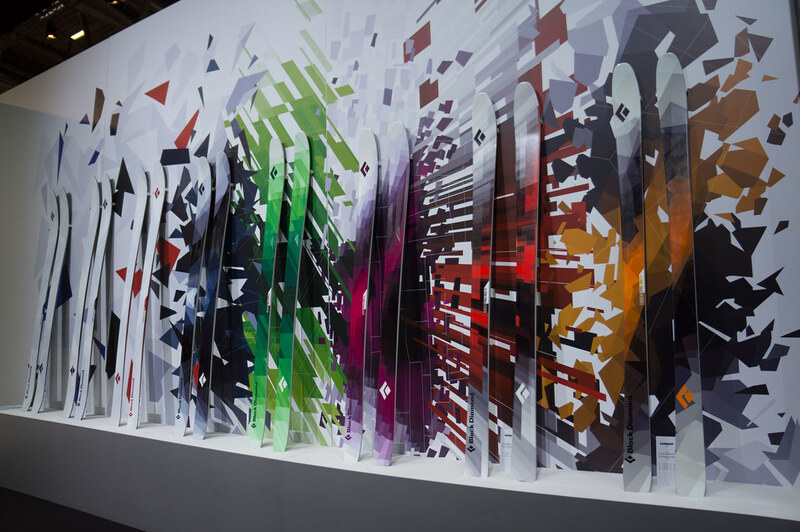 The Rando, Freeski and ROC series all got new garments, many using different Gore-Tex membranes. Colour-wise the Swedes also showed that they are not afraid to use them, and I really liked what I saw. Very nice was the Roc Rescue 40, a backpack that was developed together with Alpine Rescue Switzerland. A toploader with a zippered front opening, floating & detachable lid, and able to carry all your gear, I can imagine this pack will be popular who haul big loads to the crag. Oh, and happy birthday: The company gets 100 years old this year! 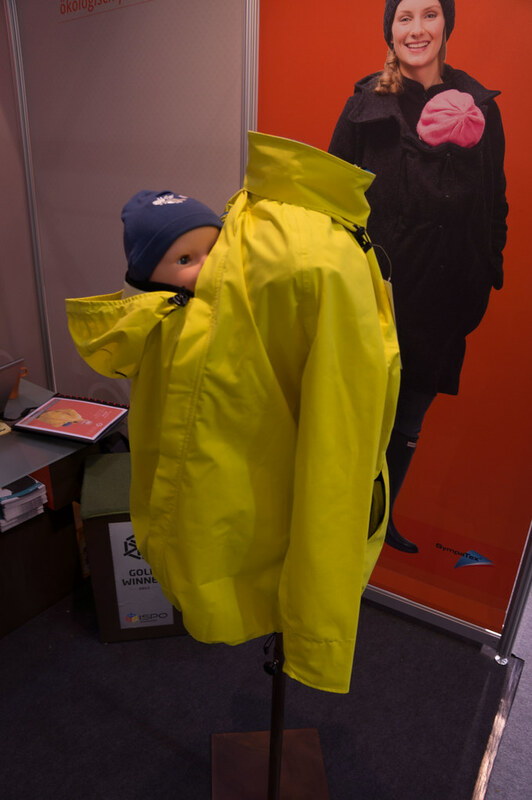 ISBJÖRN of Sweden had a lovely new collection, and their Antarctic Winter Parka looked superb to keep kids warm in the winter. 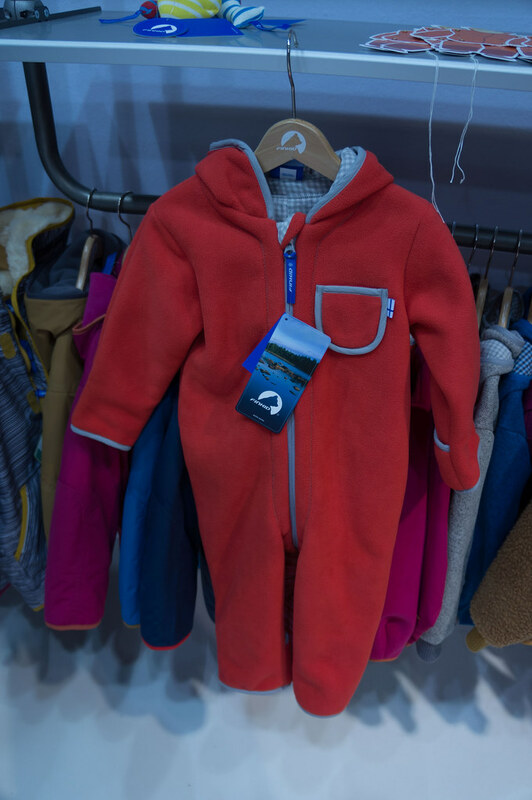 The Swedish company, founded by two Moms, expanded into skiing garments for kids up to 12 years old, and the garments fulfil the needs of little skiers. The Lightweight Baby Jumpsuit is a Windstopper jumpsuit for babies and toddlers, and it looked so good, I almost wanted one for myself! 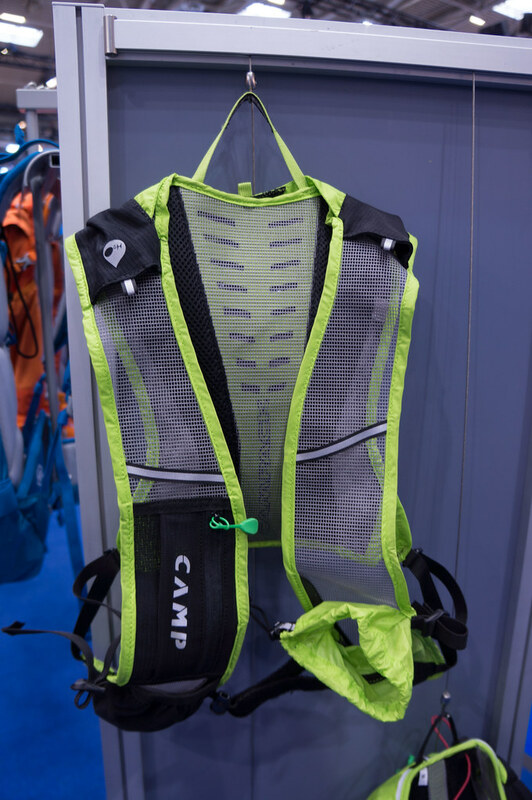 The Salomon S-Lab Hydro Jacket folds away as a belt, while you’re running. It’s light, sheds wind and water, and probably will be something we’ll see on a lot of trailrunning events in the next years. 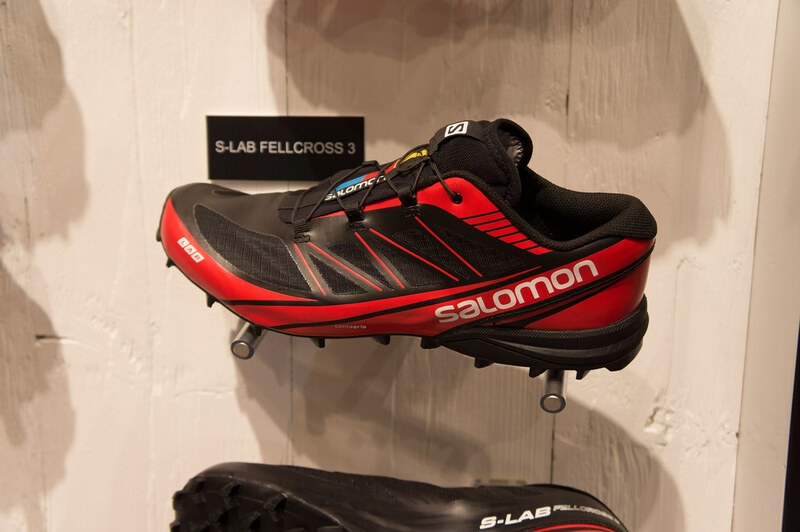 The S-Lab Fellcross 3 is an aggressively profiled - surprise! - fellrunning shoe, which will perform fine on your local trails, too. Finkid is a company started by Finns, in Germany. 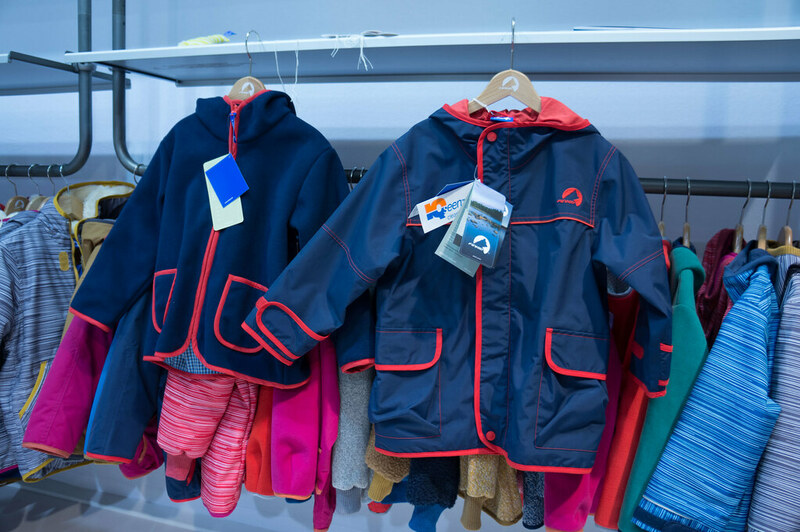 They make very beautiful and functional garments for kids, and their Tonttu line has fleece jackets, softshells and Parkas for your little one, which look magical. Many of their garments are zip-in jackets, which allow you to use one jacket year-round! 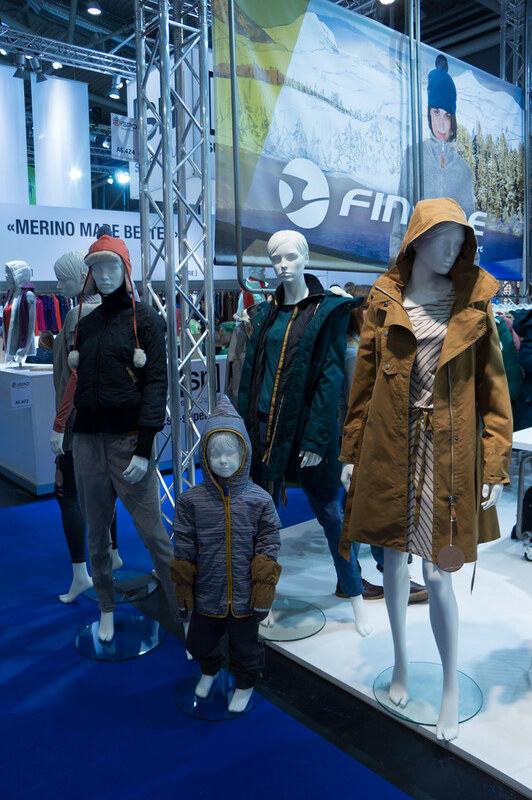 Finside is the sister company and makes pretty garments for women - their Taru jacket won the Polartex Apex Award in 2013. Light My Fire moved all their production to Sweden. Their news are Grandpa’s FireGrill, which allows you to grill your toasts and that freshly caught trout. 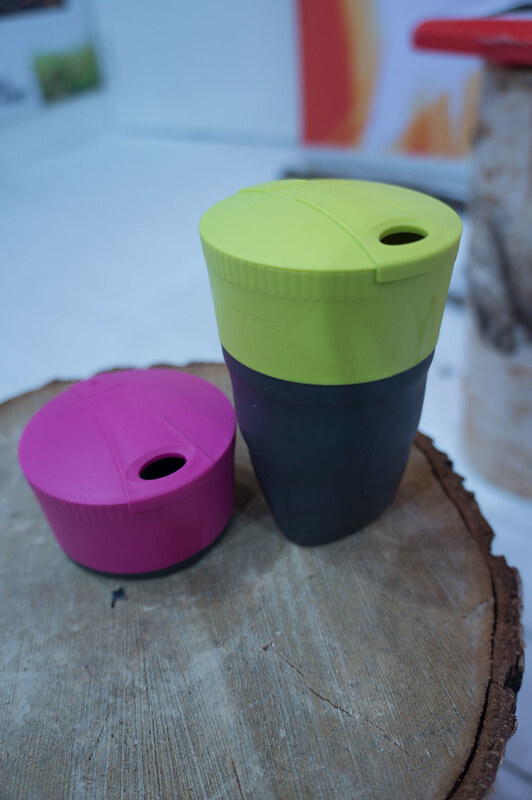 The Pack-up-Bottle and Pack-up-Cup are modern takes on the classic Fold-A-Cup (they even share the hyphen). I see that the cup might get popular, given that it packs small, holds 260 ml, and weighs only 54 g! 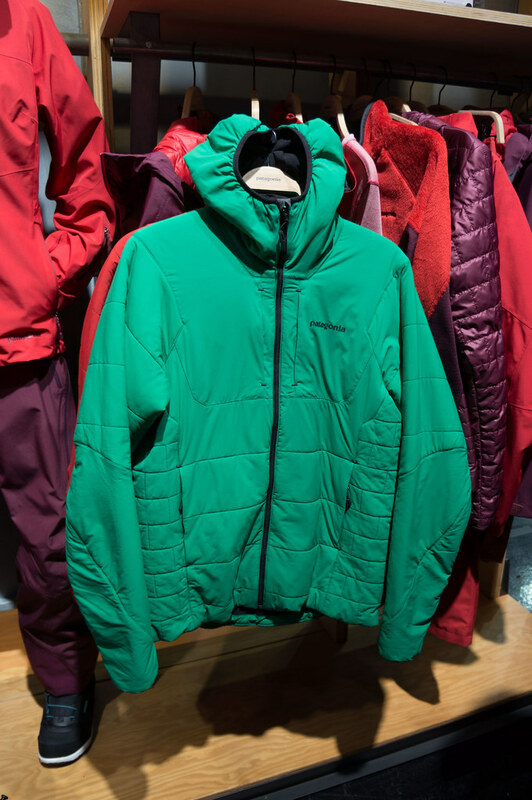 Patagonia’s Nano Air jacket & hoody are 354 g/ 385 g light insulation garments, that use FullRange insulation from Toray. It has stretch and breathability, making it a great (alpine) climbing garment. This is what Josh Wharton, Patagonia alpine ambassador, has to say about it: “With a traditional high-loft insulation layer you are usually taking the jacket on and off throughout the day, but with the new Nano Air Jacket, you can keep it on throughout.” Sounds good to me! There were several more exciting pieces from Yvon Chouinard’s company, including trailrunning and approach shoes, a new climbing pack that’s designed by Steve House, 100% traceable down garments, and swell looking wetsuits for surfers. 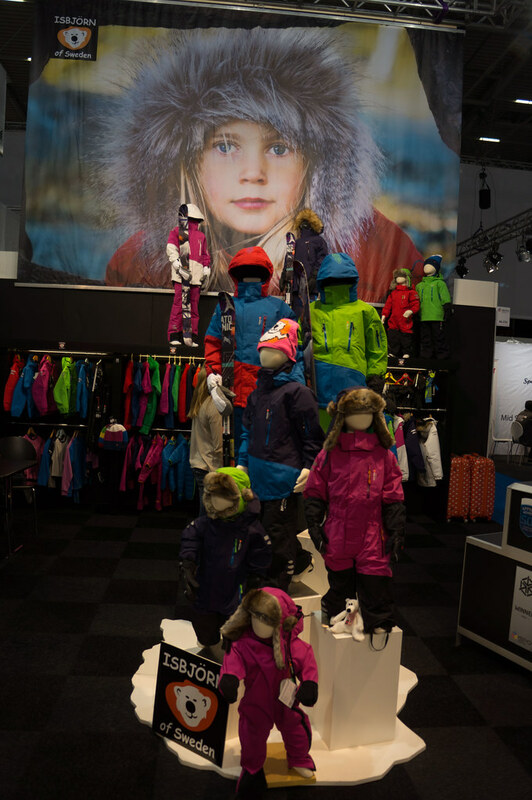 Norrøna introduced a Junior line, so now your kids can dress up in the same great garments as you! All classic garments from the various lines - from the falketind and trollveggen to the lofoten - now are available for kids. Everything is the same - same details, same materials, same colours. Just the sizes are different! The lofoten line enters it’s 3.0 incarnation. 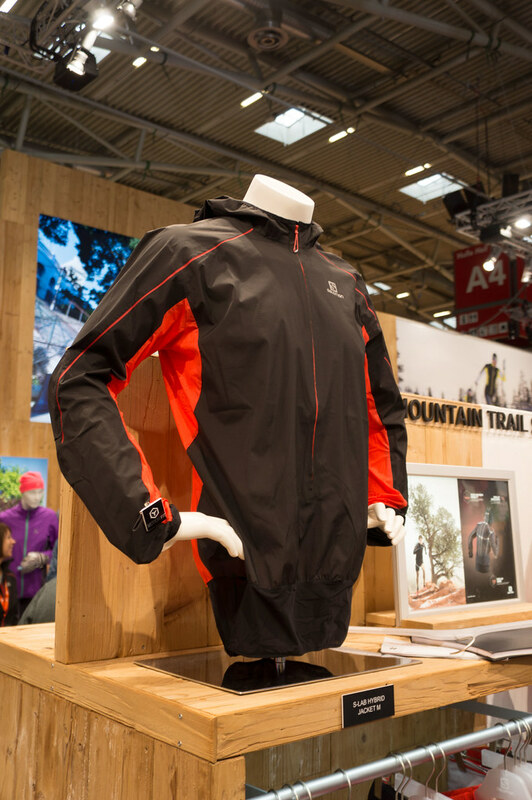 New is the lofoten Gore-Tex Active Anorak, which is a very light & breathable freeriding-piece. 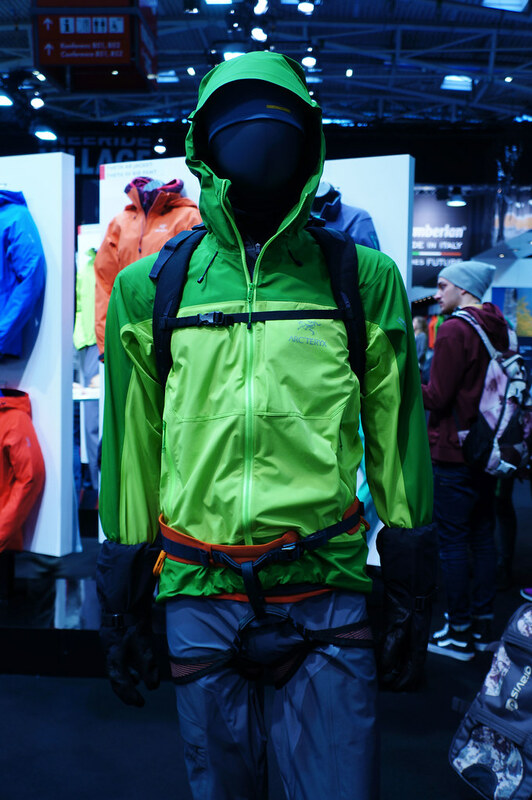 And also new is the lofoten Alpha jacket, the first jacket from Norrøna that uses Polartec Alpha. 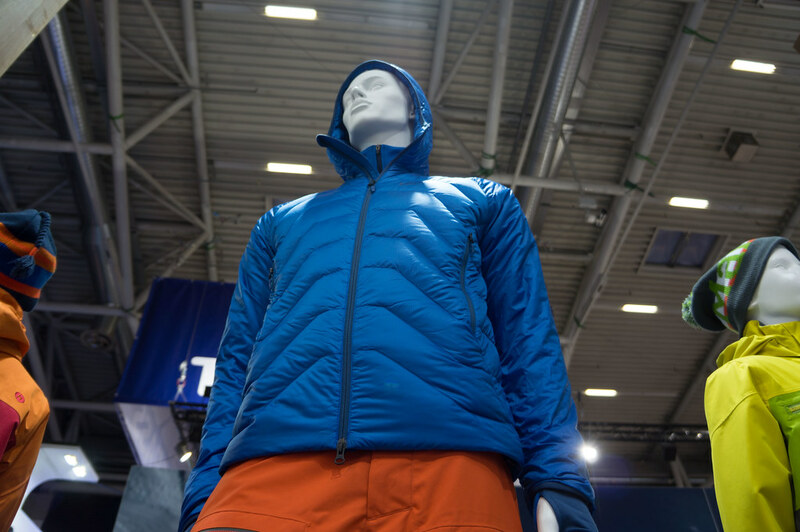 Klättermusen won an ISPO Gold Award for their Hagal Hoodie, a garment that combines Merino wool and Windstretch to make a warm, moisture-wicking and windproof midlayer. Good pockets, a smart hood, hidden thumbloops, made partly from sustainable materials - this looked like a wonderful garment. Meeting with The OMM is always great. The team is friendly & relaxed and happy to show off their new gear - which rocks, btw. 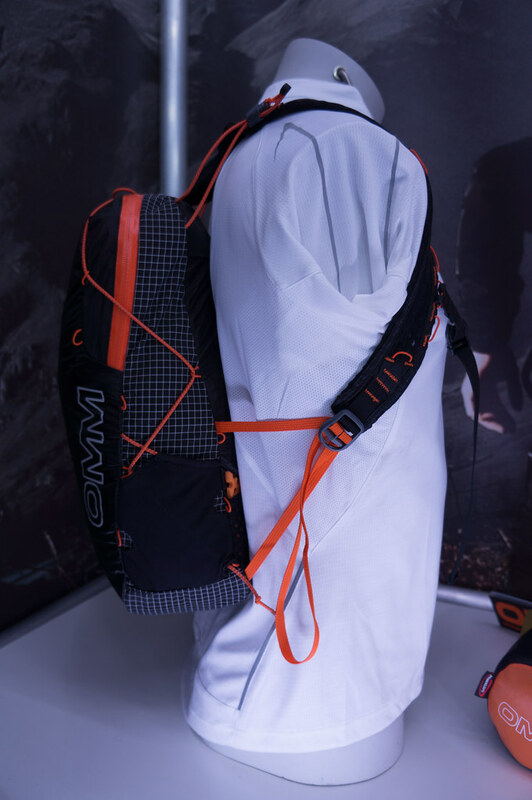 The new Phantom 12 backpack (and it’s larger siblings) look superb and should give trailrunners, fellracers, fastpackers and ultralighters plenty to be excited about. A harness that gives you freedom of movement and is very well made, this pack will be popular. Also the new smock, which will be sub 200 g, was a pleasure to wear - soft on the skin, waterproof, breathable, packs very small with a great hood. An excellent garment which I hope to try soon. BEAL had a slew of new gear. 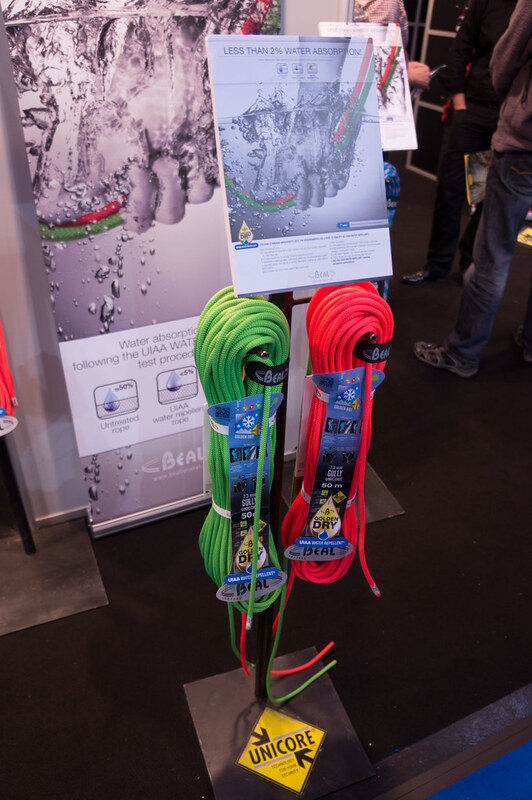 The Gully Rope is the lightest half & twin rope available (7,3 mm, 36 g/m), and best of all: It absorbs less than 2% water! If you ever have climbed ice and hated to carry double the weight of your rope back, you will love this rope. New were also the harnesses, helmets and hardware from BEAL, which are made with low impact forces and energy absorption in mind. They’re also priced were good, and should be very attractive for beginners. 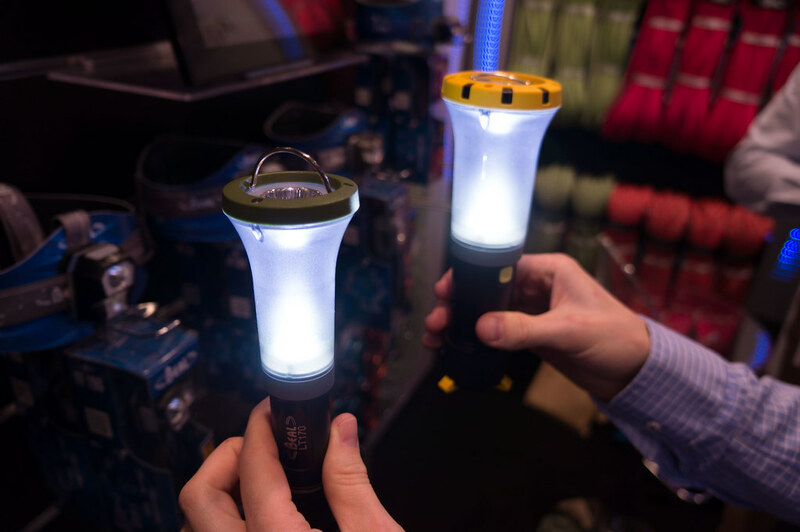 The lamps were nice, too: The L24 is a 29 g lamp which looks like a great eLite alternative, while the LT 170 and LT 190 are hand torches that transform into lanterns. Many of us like to go outdoors when the sun shines. 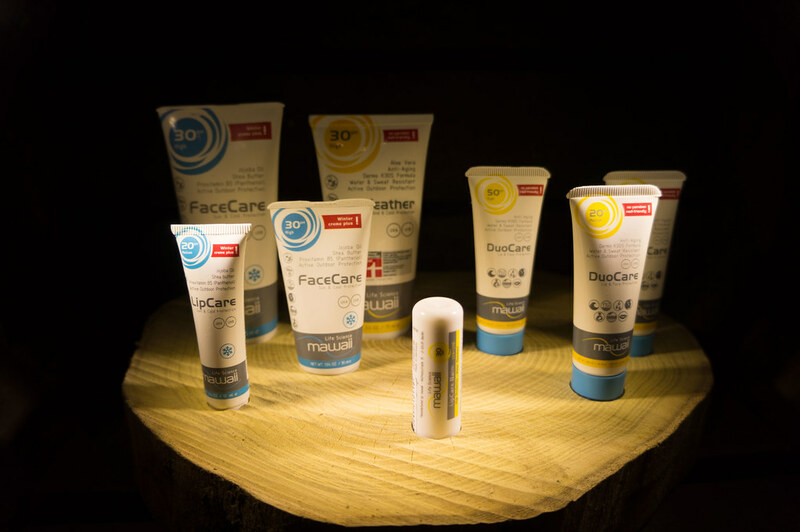 mawaii has made a sun protection line for us outdoor folks, that’s not sticky & oily, that uses natural ingredients to provide the skin with valuable moisture & vitamins to protect it from UV rays and cold weather. It smells great, is Made in Germany and is already available! I’ve got some products on test, so expect a review some time soon. 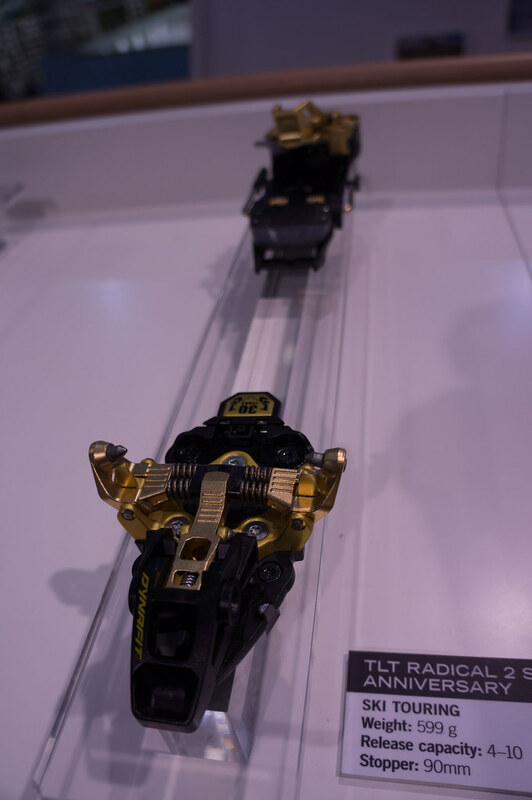 Edelrid was showing off their Beast Light crampons, at 680 g at the moment the world’s lightest ice climbing crampon - and an ISPO Award winner, too. Made from aluminium and forged steel front points, with an included antibot, this looks like a fine tool for those like to go fast & light. Their Corbie rope, also an ISPO Gold Award winner, is a rope for the climbing-jack-of-all-trades: It’s a certified single, twin and half-rope! 8,6 mm thick, 51 g/m this is an ideal rope for climbing where weight matters. At 95 g the ultralighter in me was delighted about this item: The Pocket Spike from ORTOVOX. 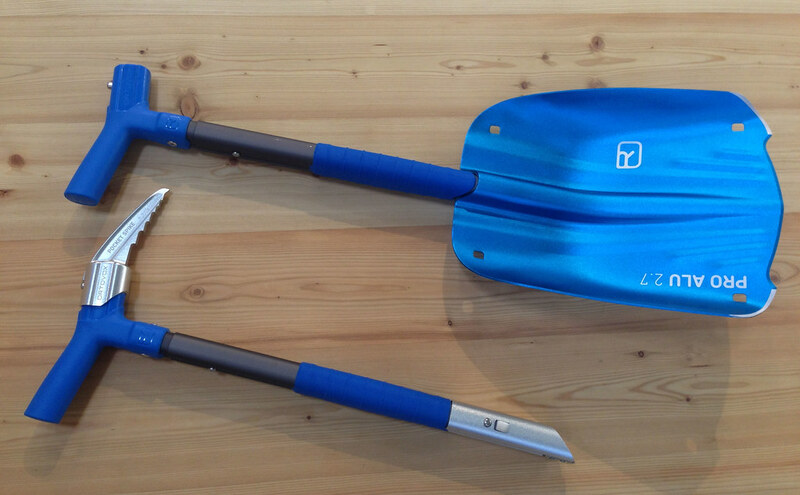 It transforms your avalanche shovel into an ice pick, and so makes the final ascent to the summit possible. It packs small away when not needed, and is a really smart little extra. CAMP/ CASSIN had a lot of sweet lightweight gear on their booth. 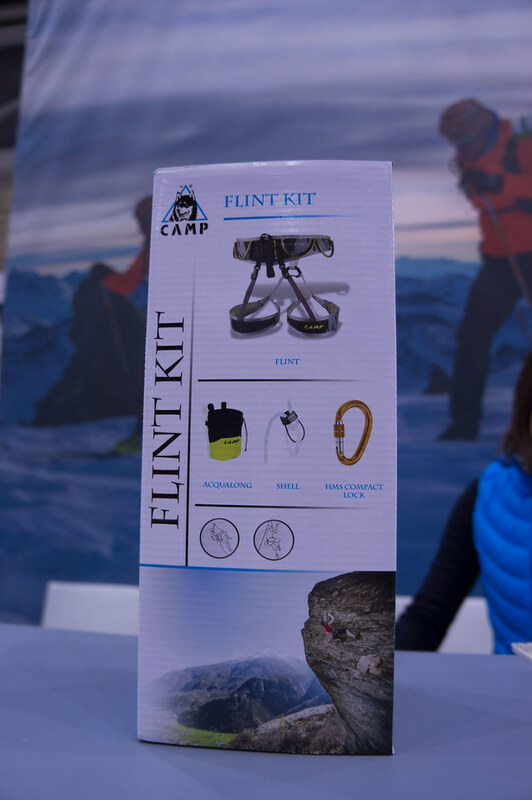 The Flint harness set should proof very popular with climbing beginners and those that need a 2nd harness to equip their belay slaves - great good value for the set. 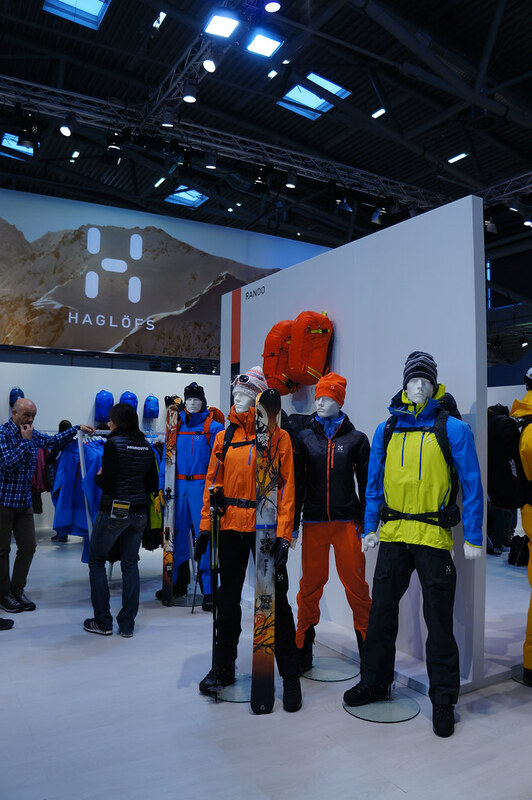 Their trailrunning packs looked great too, and as the Italians know how to make lightweight gear for ski mountaineering races, I’m sure those packs will be good, too. The glove with a PrimaLoft mitt which stores away in the wrist when not needed is superb, and I see it becoming popular for spring and autumn hikes. 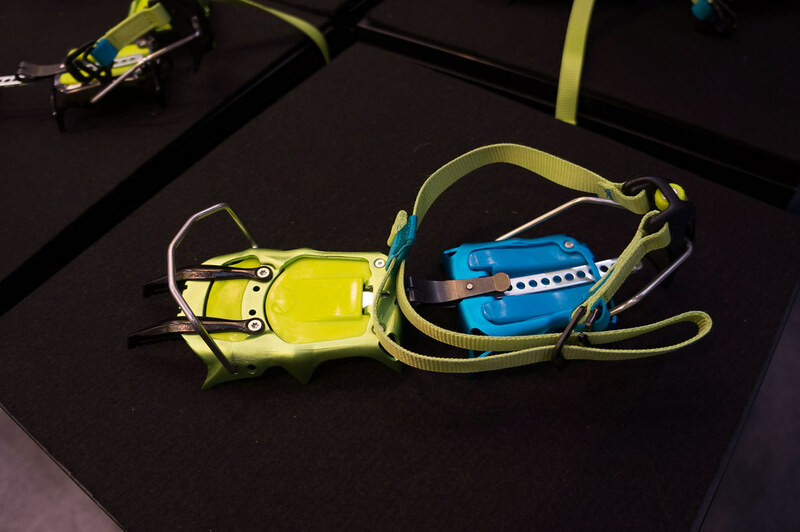 The CASSIN Blade Runner crampons are very versatile technical ice crampons: Interchangeable front points, asymmetric design for a good fit with modern boots, Anti-balling plates, these crampons - while at 1015 g for the pair not UL - looked very cool. 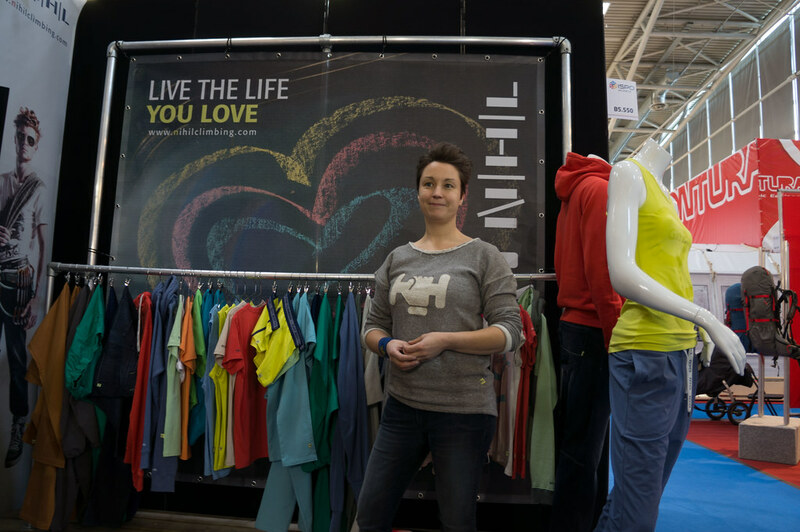 mamalila makes garments for moms and dads. It’s one of those concepts where you think “D’uh! That’s so obvious a solution!”. At the beginning, it are functional & stylish garments, that when mom becomes pregnant can be adapted with an insert for the growing belly. And once the little one is there, he can be carried with the help of a manduca or similar under the garment, well protected from rain & wind, close to mom (or dad!). 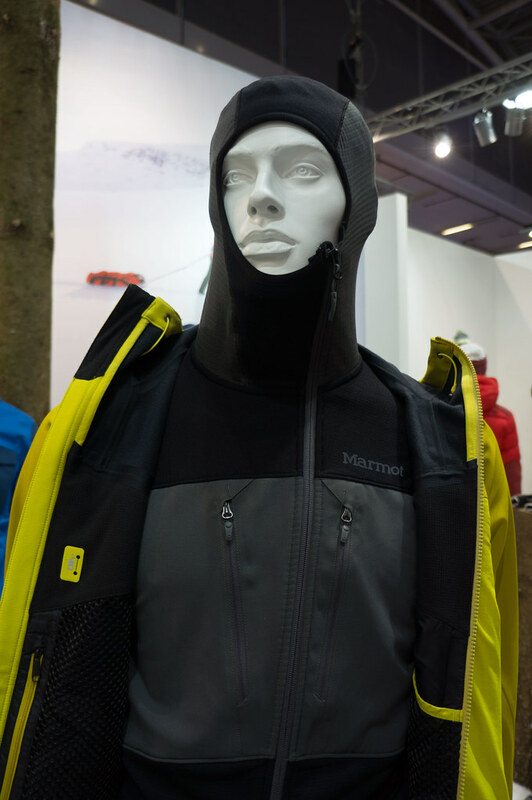 Marmot has several new garments which should be of interest for climbers & backpackers alike. 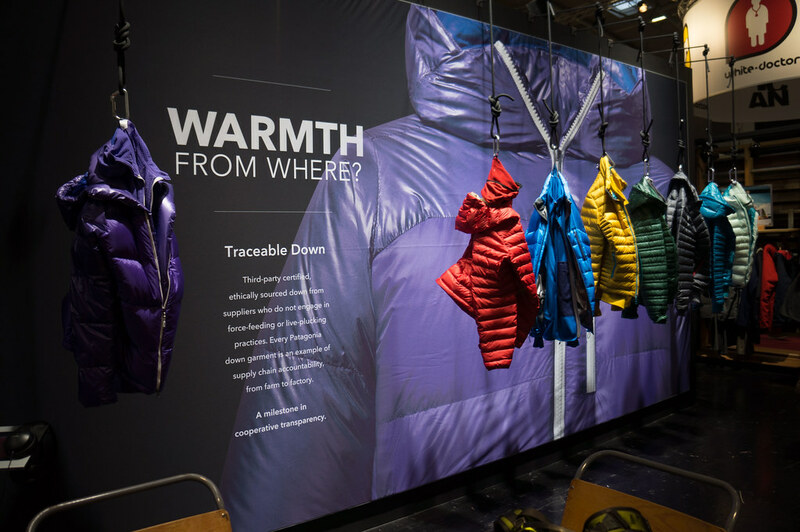 I liked their TRP System, Marmot’s own layering system, if you’d like. TRP stands for Transport, Regulate and Protect, and they make use of a lot of Polartec garments in this system at the beginning. The Misto Jacket and Pants are NeoShell/ m1 softshell garments for ice climbers, while the Megawatt Jacket is a insulation garment that mixes 800 cuin down and Polartec Alpha in two layers. 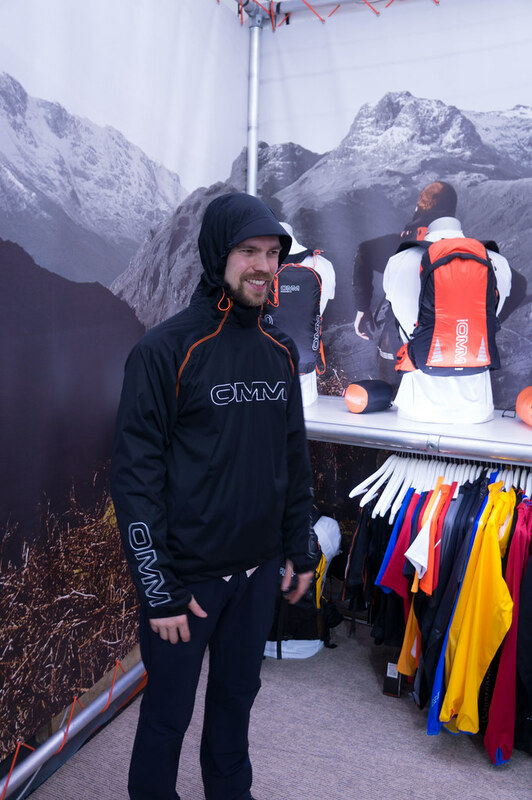 The Thermo Stretch Hoody is a sweet looking hoody that combines Power Stretch Pro & Power Dry, and should also for XC skiers and winter backpackers of high interest. 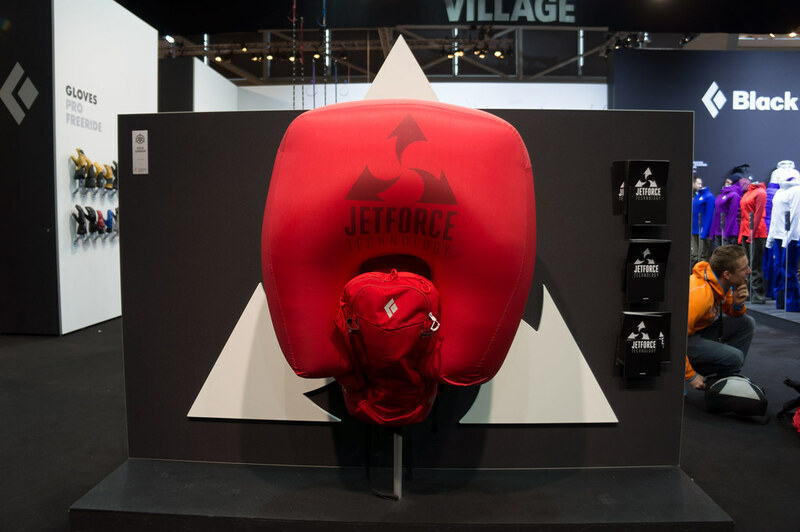 The big news at Black Diamond was their JetForce Technology, Avalanche Airbag-Technology with jet-fan inflation. 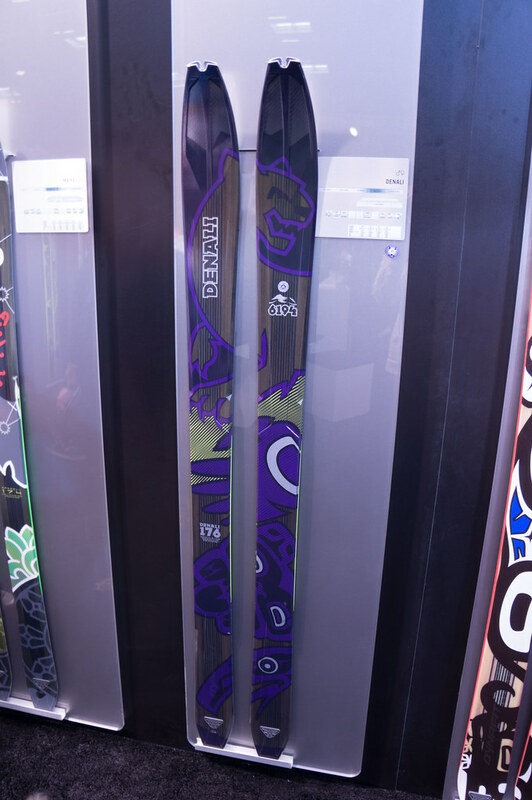 It won an ISPO Gold Award, as did the Carbon Megawatt skis. 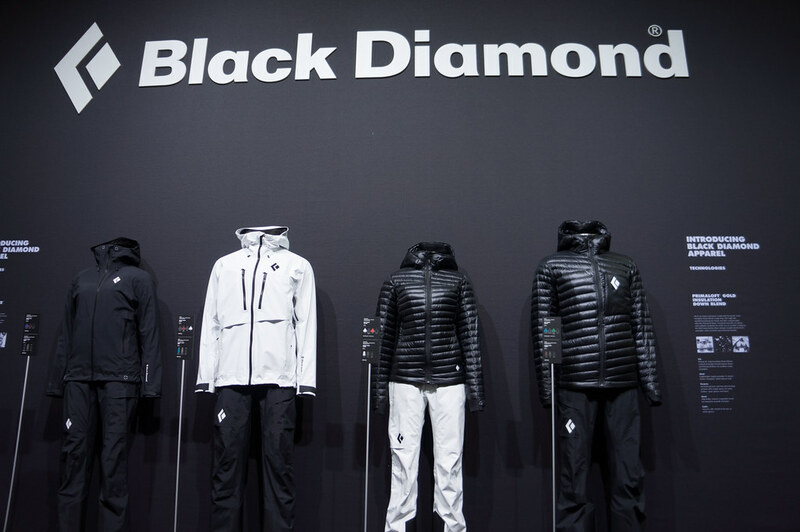 But you couldn’t miss seeing the growing apparel line: The successful Dawn Patrol softshell line is now accompanied by Gore-Tex jackets & pants, Polartec, Windstopper & PrimaLoft garments, as well as PrimaLoft Gold Insulation Down Blend garments like the Black Diamond Hot Forge Hoody. 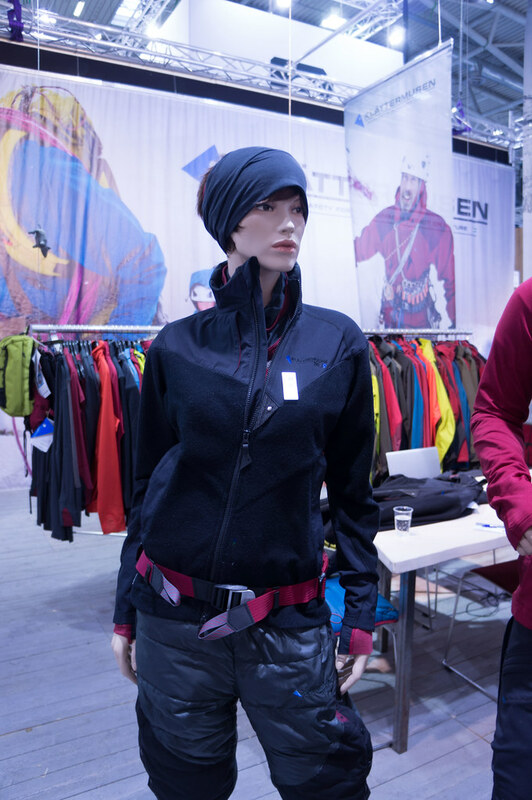 Design, fit and details look spot-on for the climbing & skiing clientele of the company, though some of their garments also will appeals to hikers. 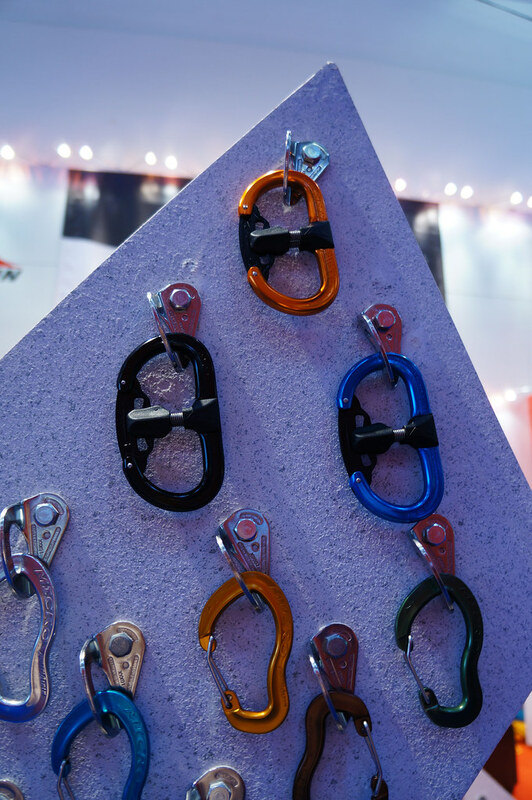 A revolution in climbing safety, no less, is what Grivel promises with their new Twin Gate carabiners. 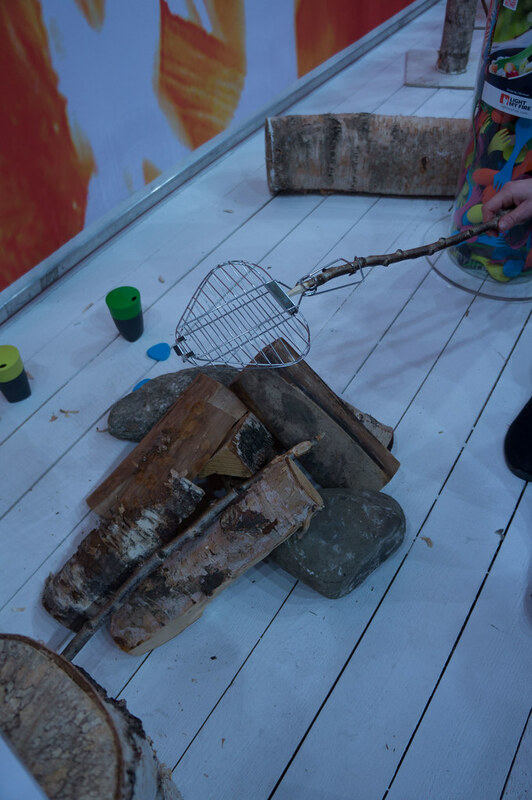 And indeed they do look like a very smart solution, especially when Stevie Haston demonstrates how easy they’re to use and how “dangerous” normal ‘biners are. It’s a great, simple solution, though, and I for one am curious to see how they will fair in real world use, and if we’ll see other “safe” ‘biner being replaced by them. OAC introduced their new EA binding, the successor to their successful X-Trace binding. 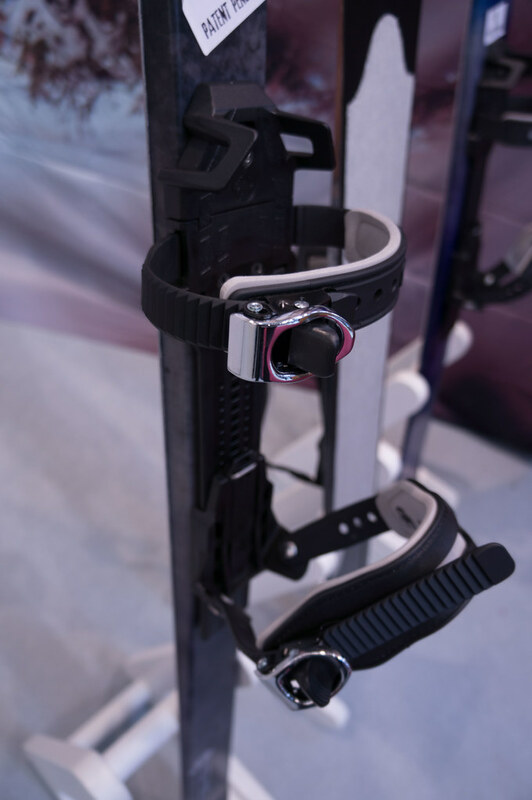 1050 g for the pair and easier to adjust & assemble, they work great with OAC BC skis and Nordic Touring skates. 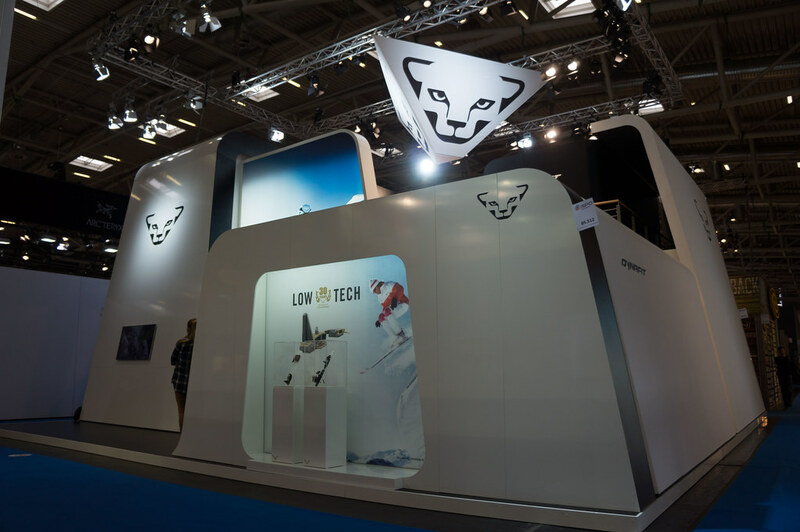 Nordic Touring will be one of the big trends in the next years, so OAC with their sweet line-up and years of experience are set to be very successful in that segment. 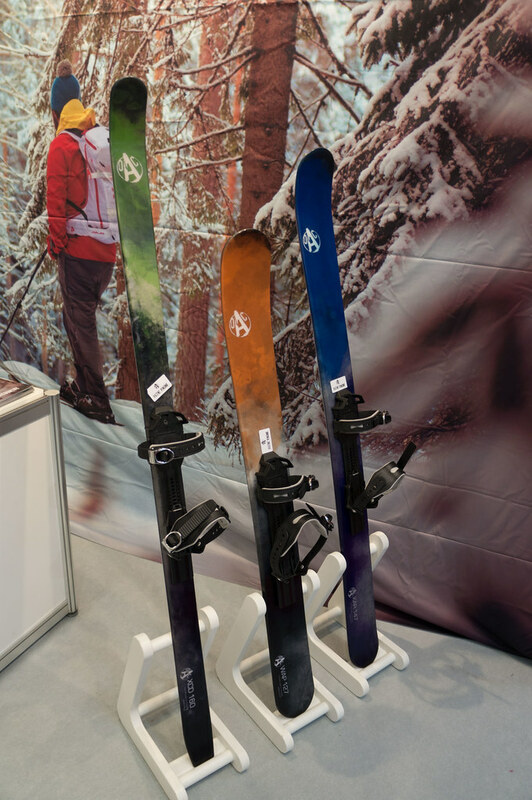 But also their new skis - the KAR 147, WAP 127 and XCD - will continue to be popular and make the easy skiing these allow accessible to a wide audience. BUFF has gone from tube shawls to, well, a very wide range! 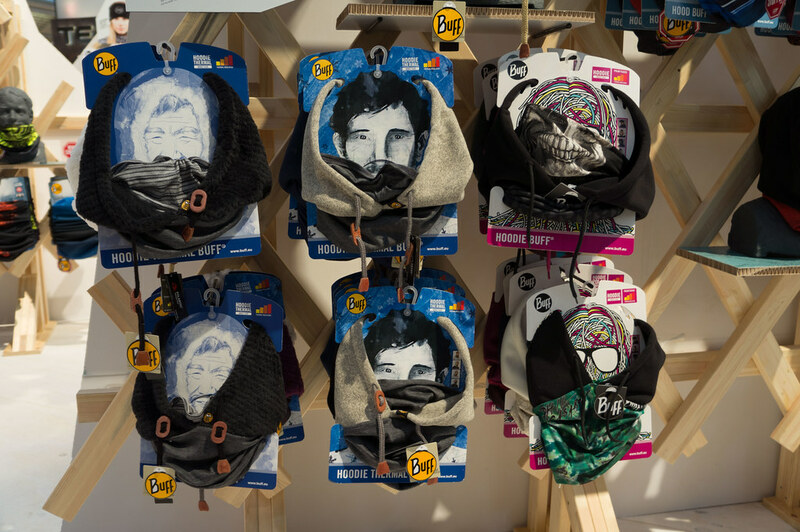 There’s a BUFF now for pretty much any occasion & taste, like the Thermal Hoodie BUFF, Balaclava BUFFs, Headband BUFFs, Star Wars BUFFs, Knitted Neckwarmer BUFFs, Chic BUFFs and and and. 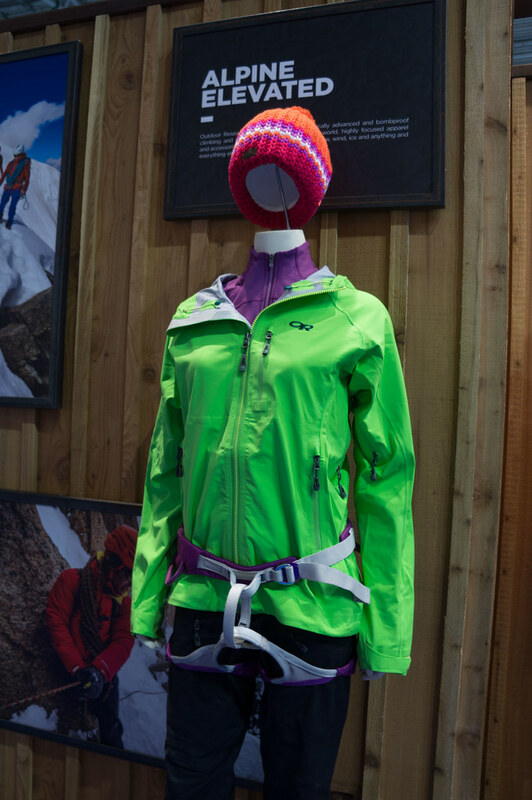 Lots of cool stuff for various applications, from skiing & climbing to running and going to the Café. 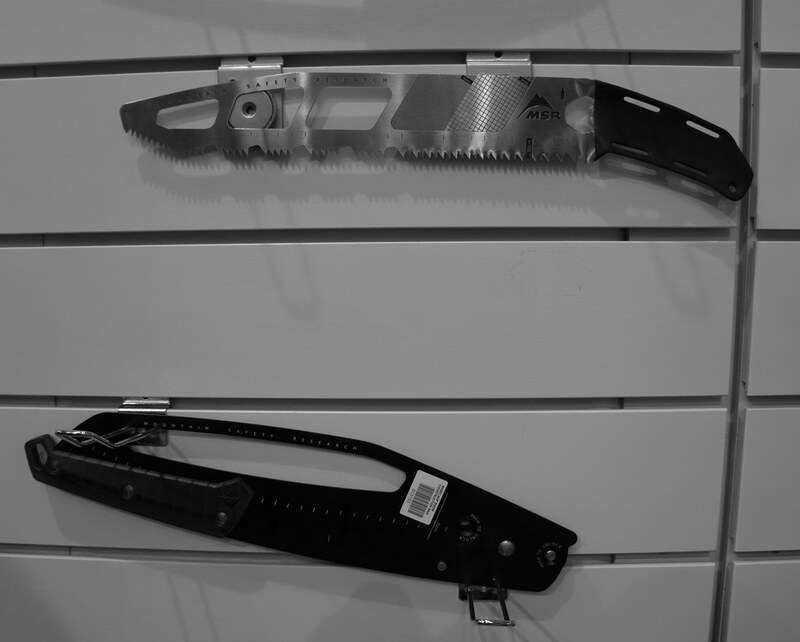 MSR used the ISPO to introduce avalanche shovels, probes, a massive snow-saw for the igloo builders out there, and the ISPO Award winning Revo snowshoe. The latter looked superb, a mix of the EVO and Lightning Ascent snowshoes with a plastic deck and aluminium side bars. They also structured the line in a new way, and added a new binding. Very good stuff, that would there be any winter here I’d be very curious to try! 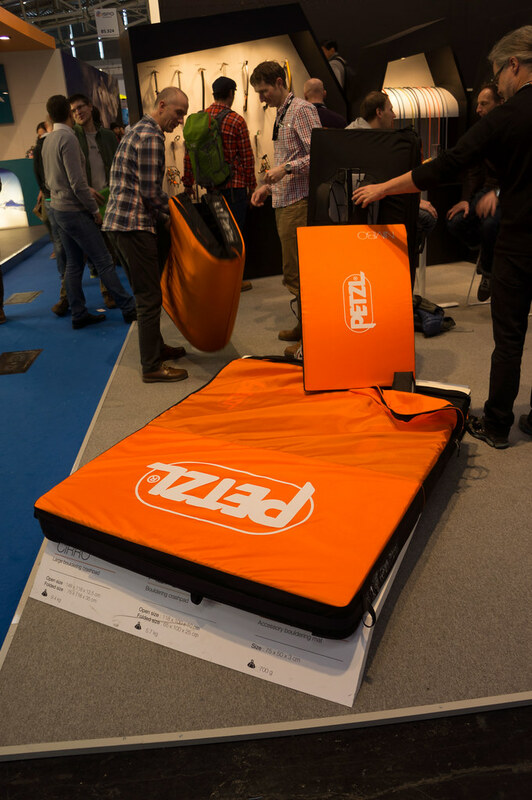 Petzl launched two crash pads and a mat at the ISPO, and they do look interesting if a tad heavy. The large one zips up so you can carry gear in it, and has a very comfy looking harness for carrying. 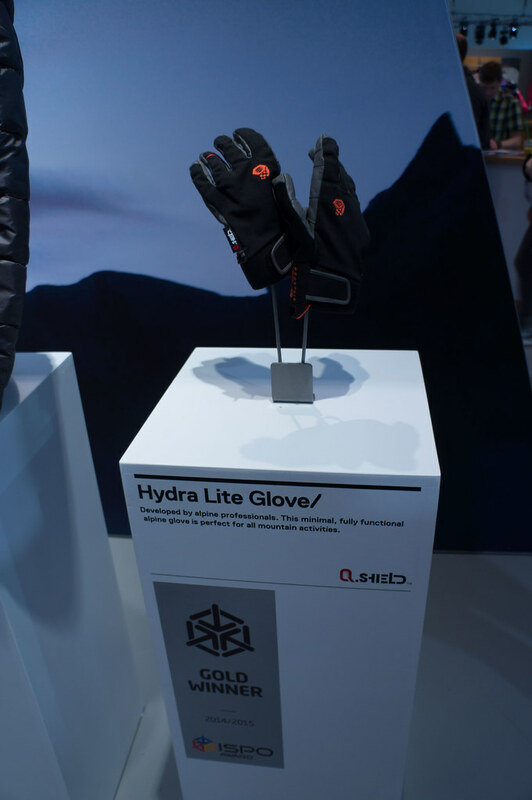 Mountain Hardwear had a couple of new garments around, of which I liked the ISPO Gold Award winning Hydra Lite Glove. 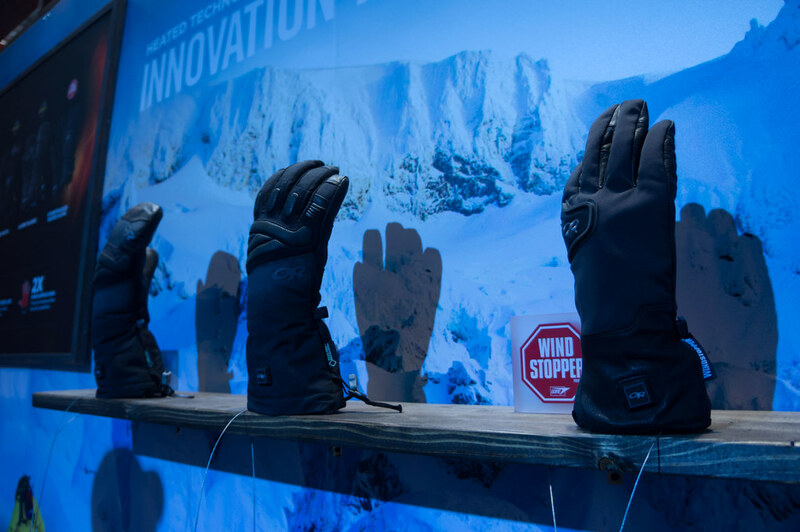 It’s an alpine climbing glove, which uses MH’s proprietary Q.Shield insulation to add warmth. It felt great on the hands, with lots of dexterity. 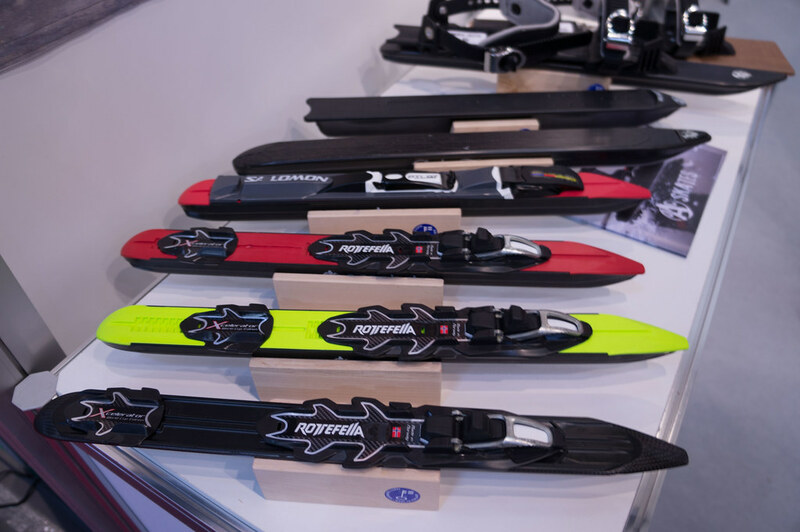 Dynafit celebrated 30 years of Low Tech with their Radical binding, launching the Radical 2 binding. These are even safer and more comfortable than the previous generation, and come in a limited Edition that gold-plated. 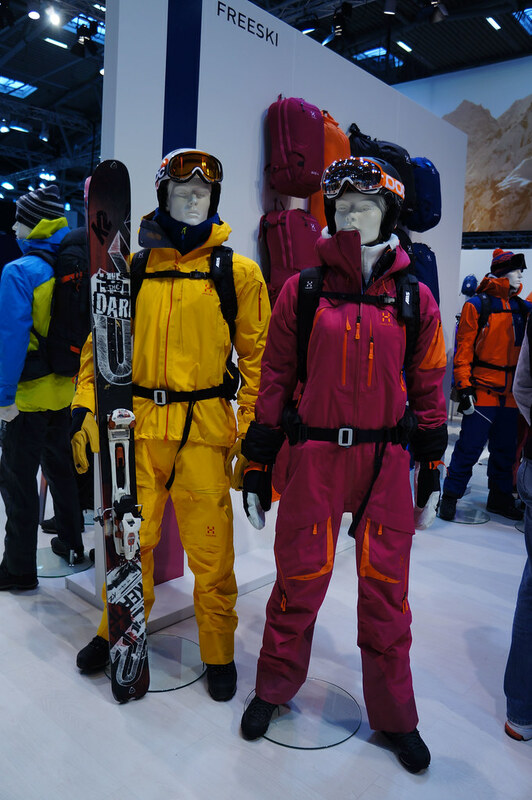 Skis had some improvements and new graphics, there’s a new Beast jacket and pants made from Gore-Tex Active and a Denali Windstopper & PrimaLoft insulation jacket. As for the gear, there certainly were some innovations and new gear. There were some interesting developments for climbing gear, be they UL ice crampons, new, safer carabiners or garments which allow you to dress less while staying just as warm & dry. I also loved the colours available, the time of drab is certainly over, and I for one like it. Also backpackers and hikers can benefit of these, as these technologies will slowly filter down to the gear we use. There were for example plenty of jackets and midlayers which would work great for hiking, without any need to change them (athletic/ slim climbing fits are in my opinion preferable to roomier fits). I did see some trends, and might pen my thoughts on these at some points. 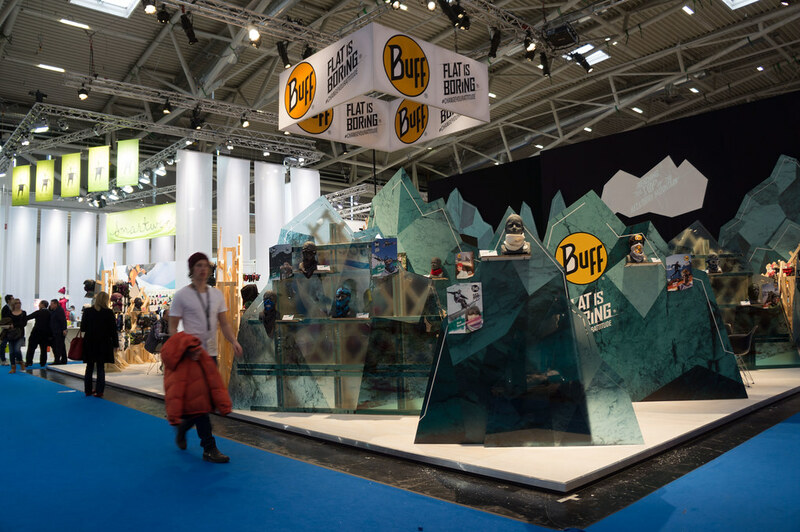 But in short: Environmental matters are becoming a big topic for outdoor companies, as they relaize that the outdoors is the playground we need to use the gear they want to sell us. 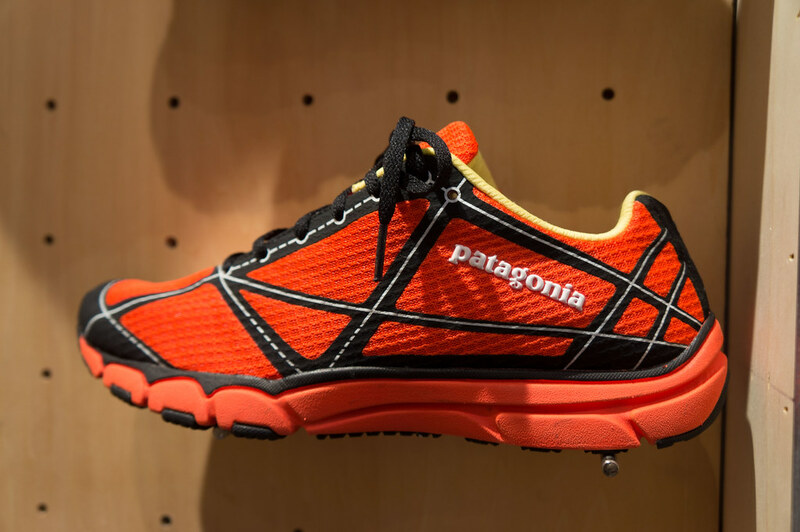 I hope we’ll see more companies will follow Patagonia’s example and lead the way in protecting the environment. For the same we’ll see more environmentally friendly materials being sought out, and there will be an increase in garments & gear that can be recycled/ upcycled/ reused at the end of their life-cycle. Also the digital gagdets & apps for the outdoors will increase. Be it apps and websites that let you see the snow conditions up on the mountain or the avalanche risk, to helping you navigate, track your movements and calorie consumption/ steps taken/ etc. - these things are on the rise and I think it will be interesting to see what smart folks come up with. If you’re hungry for more photos, see the Flickr Set. And then go out for a walk!